Thanks to connecting Adobe Business Catalyst with LiveChat, you can deliver customer service using the most popular communication channel. Depending on your needs, you can choose which customer data should be sent to and received from Adobe Business Catalyst to LiveChat. From now on, you can display customer data during chats and provide support that responds to customer expectations. Adobe Business Catalyst is an all-in-one hosted Content Management System that brings together all the features you'd need to build and manage a business website. What makes Business Catalyst useful is that no backend coding is required. Users can create fully functional websites by using the built-in modules. The solution comes with e-commerce, marketing, and reporting & analytics tools. To add to this, it offers SEO features, 301 redirects, canonical URLs, customizable meta-tags, and the integration with social media and Google Search Console. With LiveChat for Adobe Business Catalyst, you can create a professional Customer Service in no time. Grant your customers the possibility to reach out to you, whenever the need arises. Show them that you are always there, ready to answer any of their questions on the spot. Thanks to basic information about your customers you can offer more personalized help and boost customer satisfaction. You can select which data will be sent to and received from LiveChat. Depending on your needs, you might want to select different fields. Try starting with both options in Visitor Details checked and also select Customer Data and Ecommerce Data options your agents might need. A competitive advantage can be obtained by managing your products more effectively, and having good relationships with customers. With LiveChat, you can communicate with your customers in a channel they prefer while providing a superior customer experience. 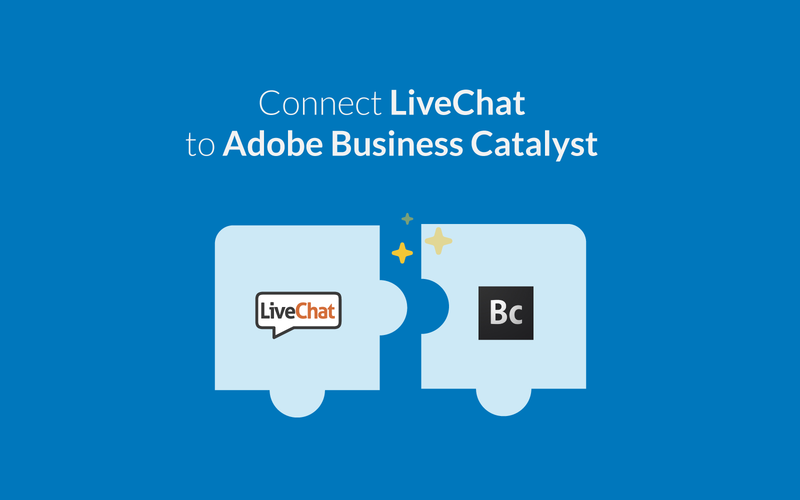 Start using LiveChat with Adobe Business Catalyst now!